Goats require a good loose mineral for optimum health. This should be available to them at all times, they will eat some when they need it. But how do you keep it available without it getting tipped over, pooped in, rained on, or otherwise contaminated? I've been seeing a lot of these "diy chick feeders" made from old plastic gallon jugs, and I thought it might present a solution. So here is how to make a zero-cost mineral feeder in less than 5 minutes. 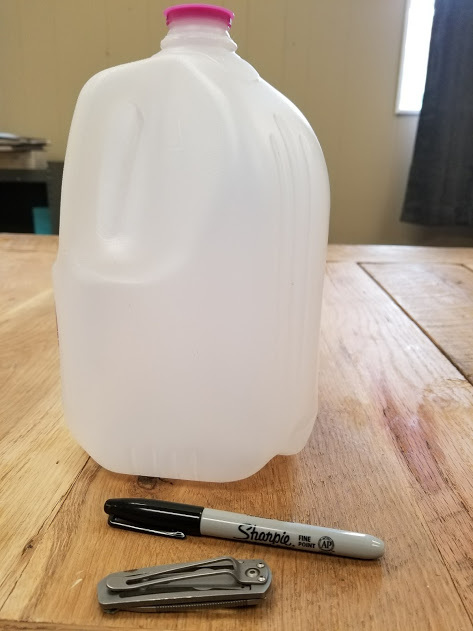 You will need a plastic gallon jug - this one is a distilled water jug that my friend Karen saved for me, but you could use milk or juice jugs that have been thoroughly washed just as easily. Since I don't buy milk, juice, or water I asked friends and co-workers to bring me their empty jugs instead. You will also need a little bit of superglue, a marker, a zip tie or two, and a blade to cut the plastic. You could wing it without the marker but I find it is easier to have a guide. 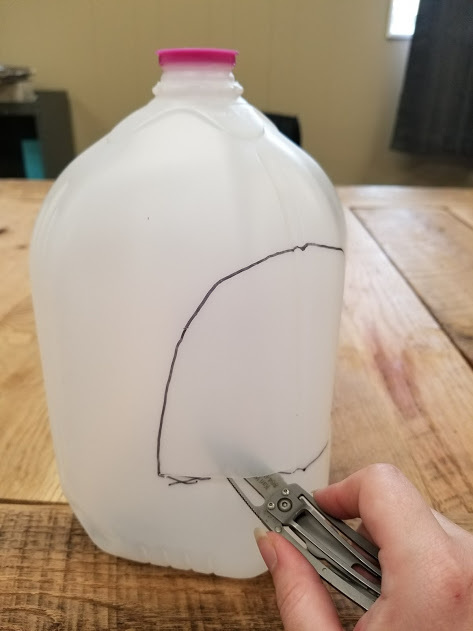 Draw a door shape on the corner of the jug, you want to do this on the corner opposite the handle. Make sure you leave the bottom of the "door" a few inches from the bottom of the jug itself. Use your blade to cut out the door shape - I used my pocket knife, a razor blade or pair of scissors will do as well. Glue the top of the jug on with a couple dabs of superglue - you don't want that plastic top coming off to get swallowed by an animal, plus it will leave a hole for rain to get in and ruin your minerals. Use your zip ties to attach the jug handle to a fence or post in the goat enclosure, and fill the jug with a few ounces of loose minerals. One jug holds enough minerals for my ten goats for 2-3 days. I like to refresh the minerals often so this works out perfectly. You can adjust how much of the minerals you put out according to how much your goats eat of them. When the jug starts to get nasty looking, cut the zip ties and throw the whole thing away - and make a new one. No cleaning or cost involved except a little of your time and whatever a zip tie costs. I've had a few people comment that they think their goats would destroy this feeder in a matter of minutes - I am sure that is true of some goats. Mine last anywhere from a month to two months before they start looking kind of gross and sad, and I throw them away. But my goats are pansies.